My Screen Recorder Pro is a screen recording program that lets you record your desktop screen activity for later playback. Any application that runs on your Windows PC can be recorded, both video and audio. You can create presentations from the screen recordings by adding your own audio narration and annotations. You can demonstrate how to use a web site or explain a product concept. 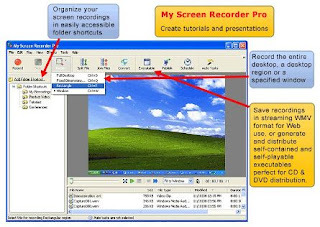 My Screen Recorder Pro provides the ability to output your screen recordings to AVI or Windows Media Video (WMV) format. AVI screen recordings are compressed using standard compressors, which make distribution simple. WMV makes very small recording files, perfect for distribution from a web site. You can even make WMV files that are designed to be played from a streaming server and presented to large audiences over the Internet. You can create self playing executables from your screen recordings. The self playing executables have been tested on all Windows operating systems. They are an excellent choice for demo distribution on CD or DVD. The executable includes a media player specifically designed for playing screen recordings. You can generate executables using many playback options and combine multiple screen recordings into one package.